To set up any e-mail account you need to have the following information to hand before you start! Note: Most modern e-mail clients will search out your details for you. 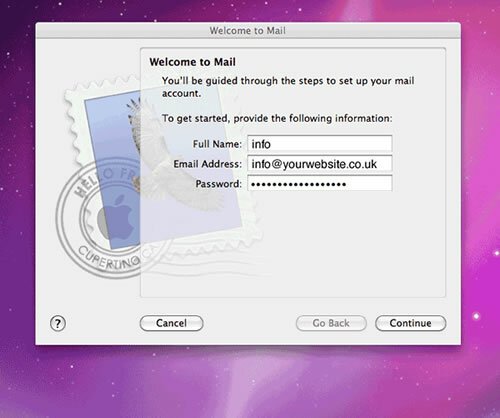 With just your username and password the e-mail client will guide you through setting up your e-mail account. This applies more-so to smart devices tablets and phablets and the like. Top Tip: If your password is long and made up of characters, numbers and symbols. To ensure you enter it correctly try selecting and copying it and then paste it into place. This helps to avoid any miss-typed password. Top Tip: You only have to set-up an e-mail account ONCE (for each e-mail account). So please take your time and enter the information carefully and accurately. Once set-up you should not have to alter the settings ever again. 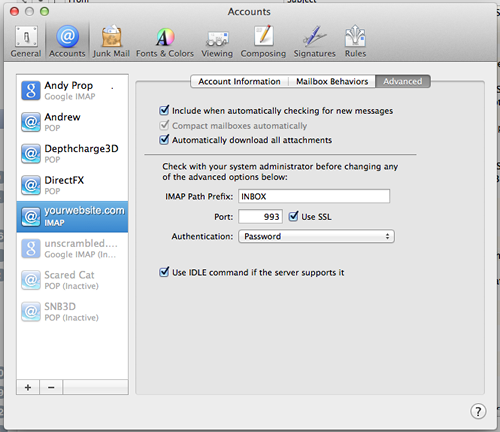 These Apple IMAP settings will vary slightly depending on who is hosting your service for you. You only have to set-up your e-mail client ONCE so please do not rush these steps and double check your information before proceeding to the next step. 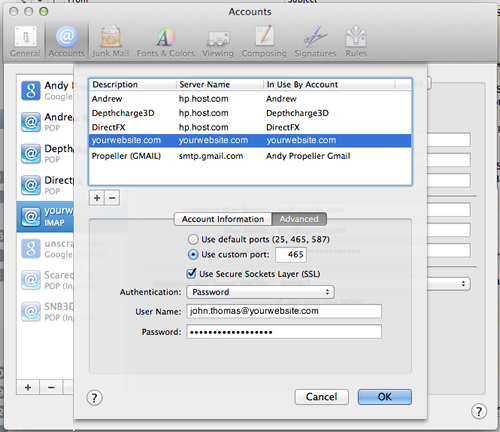 If you’re already running Apple Mail you need to add a new account. If opening Apple Mail for the first time you will see the instructions from this point. At this point, take care to enter your information accurately. 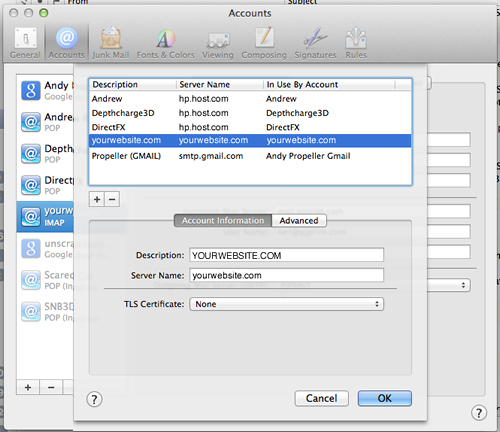 Complete your IMAP settings as indicated here. Tick the box that says “Take account online” then “Create”. 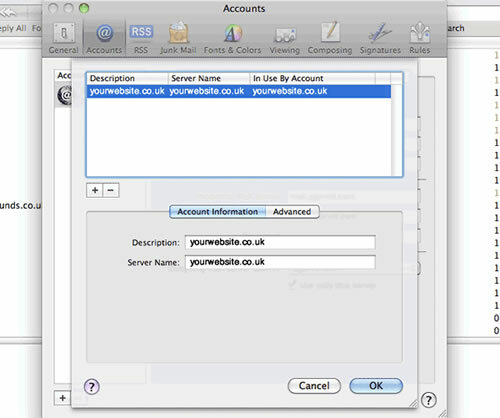 Manually “Take All Accounts Online” by right clicking on the account or control click and selecting “Take All Accounts Online” from the drop down list. 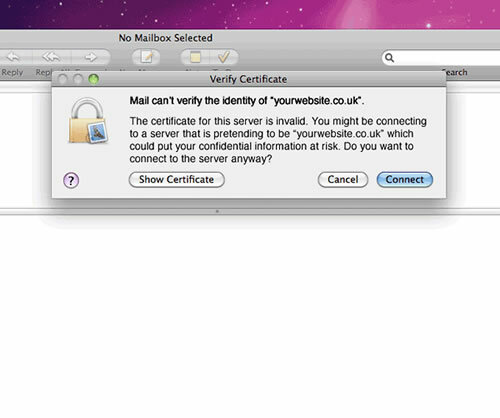 Now we see the “Verify Certificate” alert box and we’re going to “Show Certificate” to Authorise the connection with your new mail server. 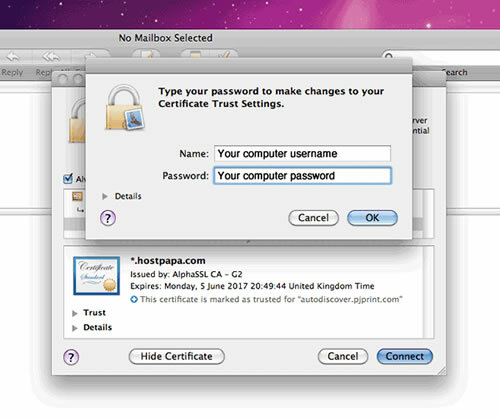 As the Administrator of your computer you will need to enter your COMPUTER’s username and password to complete this authentication. 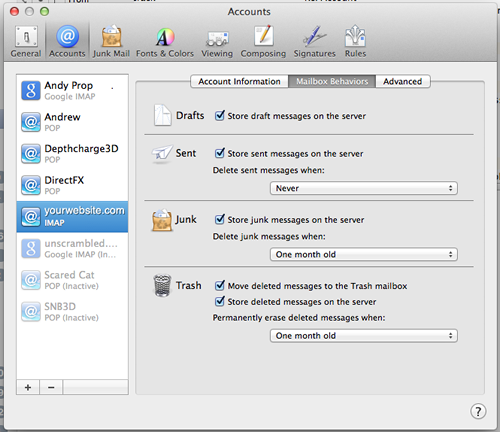 Apple Mail will then automatically wish to create different mailboxes to align itself with your mail server. Review your incoming mail settings. Review your settings. Watch out for the port Number here! 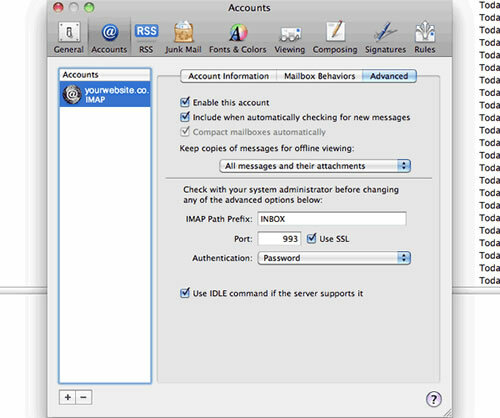 Port 993 enables SSL (Secure Socket Layer) encrypted messages which we WANT. Again, check that you’re using the appropriate port No. as provided by your ISP. Finalise your outgoing mail settings. 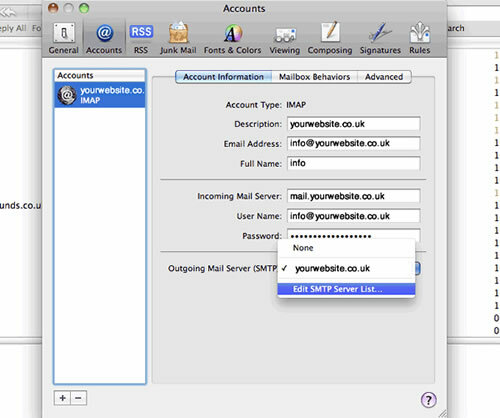 Select Edit SMTP Server List from the drop down menu on Outgoing Mail Server (SMTP). NOTE: Some Internet Service Providers (ISP’s) do not like you to send mail (outgoing mail) through anything other than their servers. (This they request to enable them to provide measures against spam). 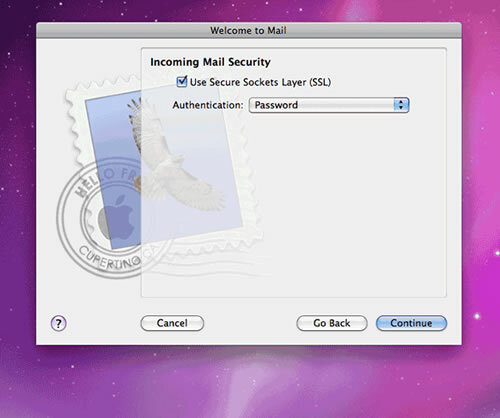 Therefore if you are not able to send mail with the settings outlined above. Request from your ISP YOUR outgoing mail settings. 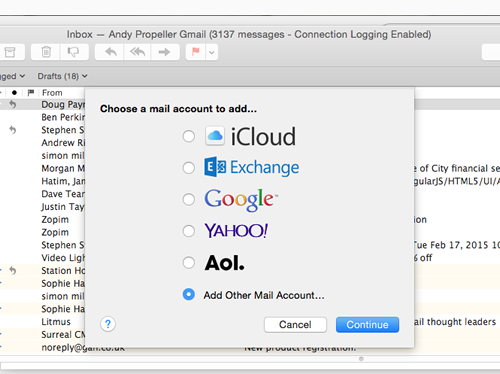 Sometimes Apple Mail does not seem to recognise new account settings when entered. 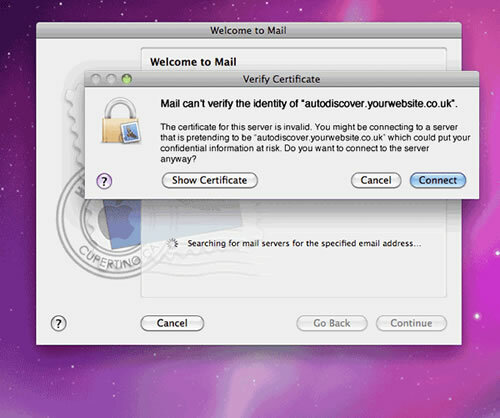 If you’re having trouble entering a new mail account then resetting Apple Mail may be of some help. 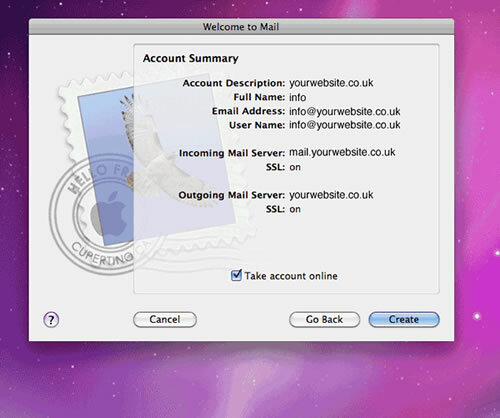 Important NOTE: Do you have any other accounts on Apple Mail other than the new e-mail account you wish to add now? You will need to make a note of all the other accounts’ settings as we’re about to delete apple mails contents and start again with it. OS - Snow Leopard instructions. 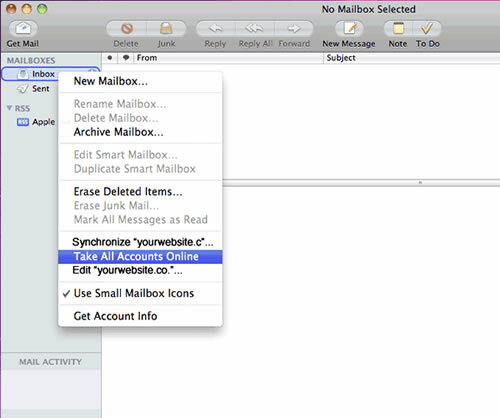 The best way to reset Mail (without loosing Saved email) is to write down your email account settings. You can refer to your notes and add the accounts once we’ve reset everything. Navigate to the folder /YourHardDrive/Users/YourUserName/Library/Preferences/ and find the file: com.apple.mail.plist : and drag it into Trash Can. Relaunch Mail. It will launch fresh as it did when it first opened (asking for new account details). Navigate to “/Library/Containers/com.apple.mail/Data/Library/Preferences” in the finder and look for the file “com.apple.mail.plist” in the folder. Click and drag the file into the trash can. Start Mail. The application acts as if you just launched it for the first time and runs the setup wizard. Follow the on-screen instructions to set up your email. You do not need to restart the Mac. What follows is a set-up for a shared (virtual) hosting service. 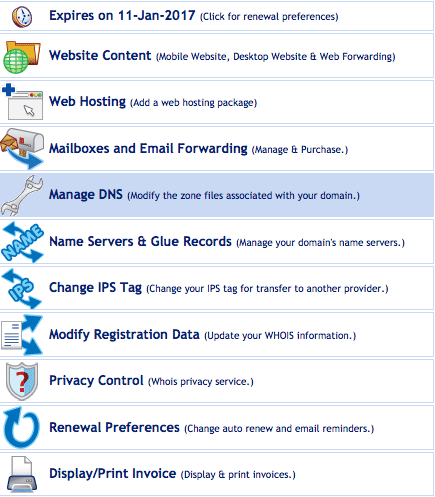 In this case it uses settings for the virtual shared hosting service of Hostpapa.com (whom I highly recommend). Why hide the incoming and outgoing server addresses of your virtual host? Because you have to provide this information to your customers and it just looks less than professional to provide them with server addresses of a shared hosting platform no matter how good the service actually is. These days most people like to retrieve their e-mail from their desktop computer AND their smart device, mobile phone, tablet and phablet etc. 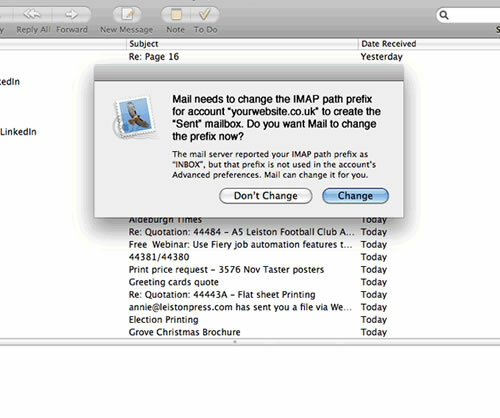 Using IMAP ensures that what they see, whichever device they’re picking their e-mail up from is uniform and consistent. 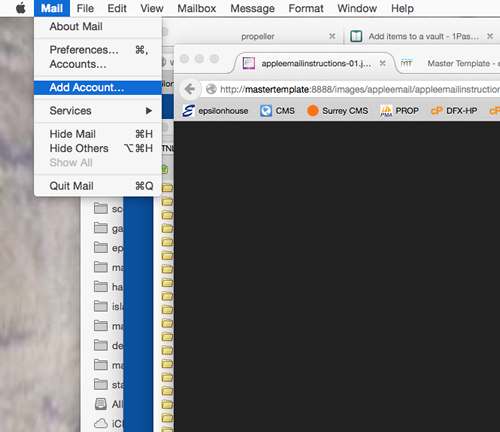 Firstly, POP3 and IMAP are the two most popular formats for delivering e-mail. (There are others). 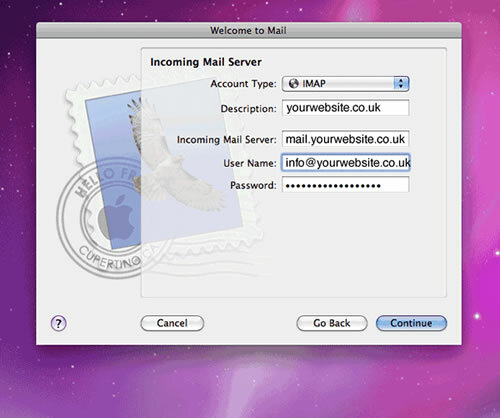 IMAP (Internet Message Access Protocol) provides your e-mail from it’s own mail server. Your e-mail is on this server that you refer to when you view your e-mail. 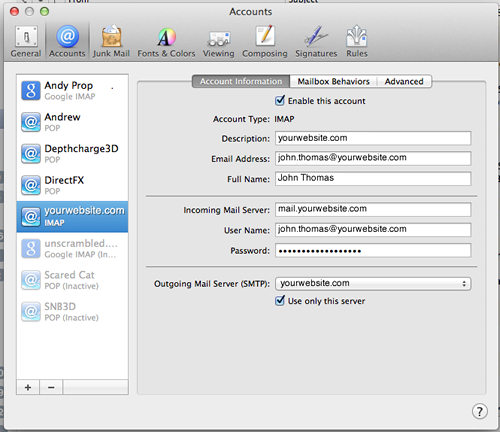 IMAP email access coordinates between the server and your chosen mail application. Messages that have been read/deleted/replied to will be marked as such on your mail server. POP3 does NOT mark any of your messages as read/deleted/replied to etc. 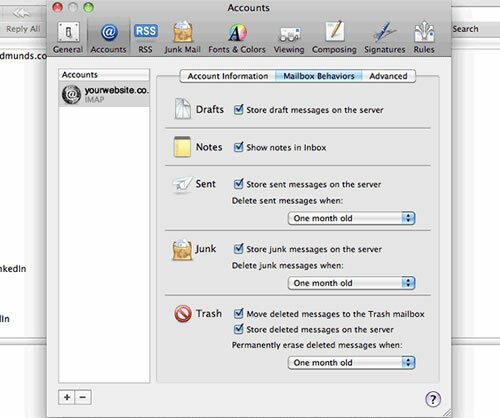 The mail server holds your messages until you retrieve them. Retrieving them removes them from the mail server. Outgoing mail is sent using SMTP (Simple Mail Transfer Protocol). It’s highly recommended to use POP3 or IMAP over SSL/TLS since they provide increased security for your interactions with your mail server. You can access (look at) your e-mail in a number of different ways. Through a web based e-mail client that requires you to have an account with them first. GMail, Hotmail (now Outlook), Yahoo etc. 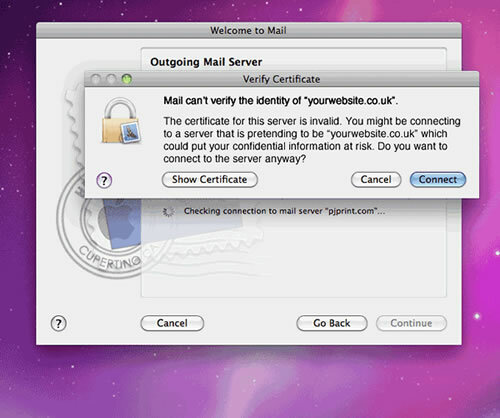 Through an e-mail client such as Thunderbird, Outlook Express, Entourage or Apple Mail etc. NOTE: web based e-mail clients such as GMail routinely automatically scan your e-mails for content and keywords and phrases. In this way they can target advertising to you. My preference would be to set-up IMAP accounts and have my customers retrieve their e-mail from their preferred e-mail client. 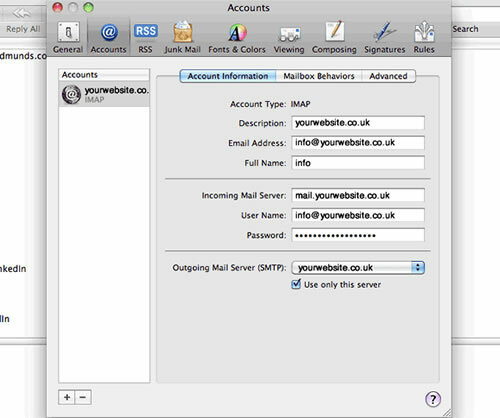 If the customer was away from the office they could pick their e-mail up from their own webmail by going online and typing “http://www.yourwebsite.com/webmail”. This using Horde or Squirrelmail etc. They could integrate more easily their mail into their Smart phone, Phablet or Tablet as IMAP is slightly easier to configure on these devices. Apple Mail Signatures are quite easy to do I hear you say. Well, yes if you’re happy with your signature being thought of as an attachment to an e-mail and not an integral part of an e-mail then yes! Design your Signature in a HTML editing program. All images in your design need to be served from the internet (Your server). Make sure all links to the images are absolute (complete url's). Click the '+' to create a new signature. Give your new e-mail signature a meaningful name (The name of the e-mail account). Type something, anything into the content field of the HTML signature. It doesn't matter what you type here we're going to overwrite later. The last step is important. 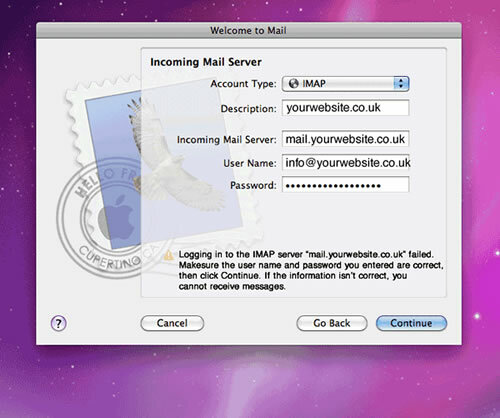 Left open and running Apple Mail will quickly overwrite any changes you may make to your signature file. Your changes won't ever stick and you'll see no difference with your signature. COMMAND-SHIFT-G to open the "find folder". View the contents of this folder by date. Locate the latest .mailsignature file (That's the one you've just created above). Open this file in the HTML editor of your choice. Paste your newly created HTML code into this document between the <body> </body> tags. Select your saved .mailsignature file. COMMAND-i (get info on this file). 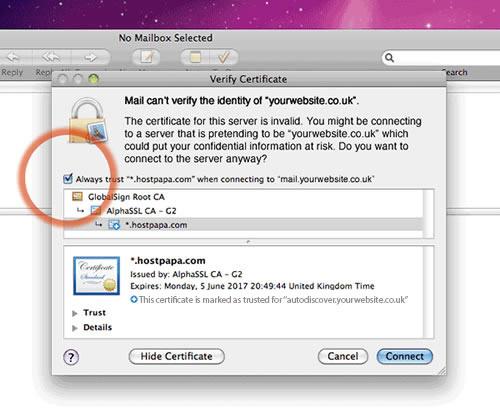 Check the tick box to lock this file (This prevents Apple Mail from overwriting your changes). Apply your signature to the e-mail account you want it to appear in. NOTE: You will not see images in your Signatures preview. They will appear only when you create a new e-mail to send. Send yourself an e-mail with your newly created signature. Test all your links etc. Why can’t I send an e-mail to hundreds of recipients in my address book at once? If you send an e-mail to many recipients at once you run the risk of having your e-mail address blacklisted as the originator of spam. This not only blocks your e-mail address from sending but also everbody elses e-mail from the domain you are sending from. So all messages from ‘yourdomain.com’ get blocked. Even if you are using your domains e-mail legitimately, unblocking domains from a blacklist can take time and expertise. A huge and what could be costly inconvenience. Also, dependent on where in the world you are sending e-mail from and how you have obtained your mailing list you may fall foul of laws. Most recently in Europe the GDPR Data protection laws. Why use a HTML e-mail bulk e-mail service? HTML bulk e-mail delivery services adhere to strict guidelines so that they are approved to send mass marketing e-mails or bulk e-mail messages. Part of the approval to be able to send bulk e-mails through their services is that they facilitate the unsubscribing process. They’re not able to send messages without this. A bonus of HTML e-mail delivery systems is that they provide statistical feedback as to how many people have opened your message, how many people have clicked on links contained within the html e-mail and even their approximate location etc. HTML e-mail creation isn’t easy! Achieving a uniform appearance between all e-mail programs (clients) is impossible. Forget everything you’ve learned about style sheets and html5! Code EVERYTHING as inline styles. Most e-mail clients have not moved with the times and are only capable of processing basic html. They are kept ‘old fashioned’ (simple) for the reasons of, SECURITY and SPEED. If you keep your HTML e-mail design basic you’ll ensure that they’ll view nicely across the majority of popular e-mail clients. You can also go some way toward making your HTML e-mail compatible with different devices with some viewport settings. Catering for ipads, iphones and other smart devices etc. Many marketing campaign softwares’ (Campaign Monitor, Copernica and the like) require some essential information. One of which is including a link for viewing the HTML e-mail online in a browser window. Good practise was to include these links at the top of your HTML e-mail giving recipients a chance to see it. If the e-mail doesn’t load properly for them they can click the link to view it in their browser. However, to do so you lose valuable promotional text within the viewing pane of mobile devices. Notice below how messages are delivered. The graphic above shows how the message pane contains the first text that it sees within the HTML e-mail. So pay close attention to the first text the design of your HTML e-mail. Change your table width and colspan to match your design. Remember to change the unsubscribe link to the format which YOUR Bulk e-mail provider recommends for their service. Your html e-mail design should be produced in a graphics package to show how the completed thing should look. You can code a html table from this. This would be enormously time consuming and arduous with many possibilities of errors creeping in. Thankfully there are Apps (programs) that automatically produce a table of your graphics for you. The market place leader being Photoshop. Slice your graphic elements to isolate them then export for web along with the HTML code. I loved Fireworks for splicing images in to tables. It was built for the task. However, Fireworks in Adobe’s infinite wisdom has discontinued this gem of web optimising App. The professional next choice is Photoshop. NOTE: Be aware that in Photoshop you will have to go to maximum zoom to make sure your slicing is sliced perfectly with no gaps or overlaps which can cause headaches for you further down the line. Create the most basic html page to insert your code. In the <head> insert the following style sheet. This style sheet overides Microsoft’s external style sheet so as to emulate almost every other browser’s interpretation of your HTML e-mail. Change your colspan to match the number of colspans in the table that you will paste in the body of this document (the table you created of the HTML e-mail design from the graphics App). Omitting the opening <table>, <tr>, <td> and closing tags as they’re already provided in this coded template. 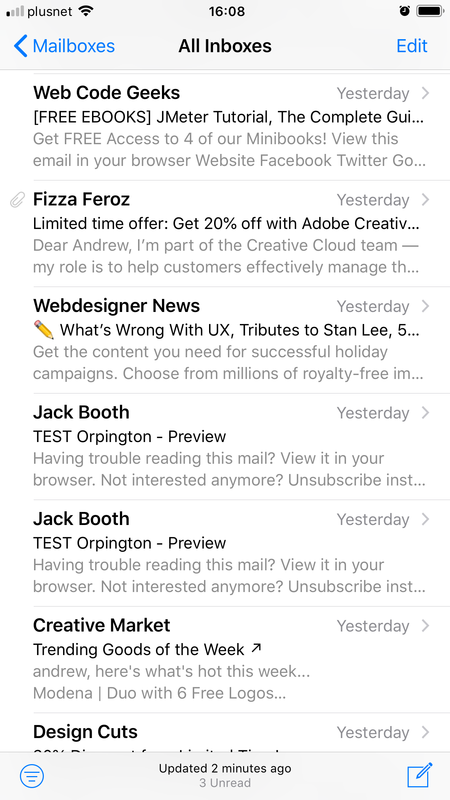 iOS Mail, Apple Mail, Android and theThunderbird e-mail client. You can specify special (non-system) fonts as the first option then supply web standard fonts as fallback options thereafter to make sure your message appears. This is the same code provided by your font provider that you might use within a website build. Adjust the bgcolor to suit your design. Adjust the styling of the text code snippet above by taking all of the measurements from the original graphic file (Usually this is a Photoshop.psd file). NB: You will never achieve a perfect match. Programs render text differently so the same font and specifications can and will look different in another program such as your browser or different e-mail clients. Most noticeably this is a weight issue that can then lead to text running over shorter or longer lines. and so on. A full list of special character entities can be found here https://dev.w3.org/html5/html-author/charref. Replace them ALL with their HTML entity code. Upload files to your server! If your HTML e-mail looks good locally in your browser it’s now time to upload it to your server. This will be the location of your “View it in a web browser” version of your HTML e-mail. Point ALL images to our server hosted images. Now that you have a “live” web version it’s time to point every single image to our “live” hosted version of that image. We have a “View it in your browser” link as part of the essential includes in our HTML e-mail. We now need to make this a link using the full url to your hosted version of the HTML e-mail. Now check your local version in your browser to make sure all links work and all graphics from your server load. VALIDATION There’s no such thing as a HTML e-mail validation service. However you can use an everyday HTML validation service which will pick up on any misspelt or unclosed tags etc. Expect to see your results with a huge amount of “Obsolete” errors! With regard to HTML e-mails this means you’ve done it right! Use W3C Validation Service and point the url to your online version and correct any unopened or unclosed tags and any mispellings. After any corrections remember to upload your file again, replacing the hosted version. Finally, a space or return in your code can (in some e-mail clients) produce a 1px vertical line (gap) where that space or return appears within table cells. It reveals itself when viewing background images or colors that have been distributed within table cells. To eliminate this problem use your text editing software to "compact" your code. Taking out all spaces and ‘carriage returns’ from your code making one long compact line of code. Voilá you now have the code to use within your Bulk e-mail service provider. There’s a method to deploy the following icons on a web page but I wanted them on my HTML e-mail therefore I’ve introduced them as images within a table that can have the link (calendar information) applied to them. Use the code provided by Add To Calendar then strip out the code for the icons for my choice of icons if you like my choice better. 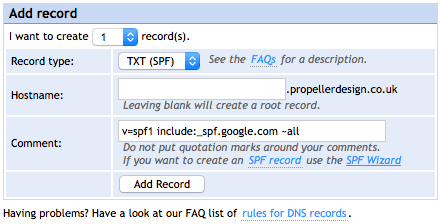 The spf .txt record below currently applies to all GMail or Google Mail (Google Apps) Accounts and should be placed in your domain registrars DNS section in the control panel for your domain. Some domain registrars require you to complete additional settings and/or information for the SPF records to be implemented properly. Some of the most popular Domain Registrars and their methods of handling SPF records can be found at Google Apps - Verify your domain. How do I check my SPF Record is working? Accounts earlier than 2016 were given free additional (user) aliases so you could add users for no additional fee. So, check to see if there’s any legacy Gmail accounts already in the name of the company you wish to administer. HOWEVER, these legacy Gmail accounts do not carry the functionality available with new accounts such as shared calendars etc. Important: With these earlier versions if aliases have not already been set-up it seems you can only add new e-mail addresses that have already been created elsewhere. !!!! Note: the e-mail still runs through it’s original server first then is picked up by Gmail. You can set this so that the e-mail is deleted from the original server when it’s picked up by Gmail thus keeping the size of the original server’s provision well within its imposed limits.. should be almost next to nothing as Gmail keeps checking and receiving e-mail. 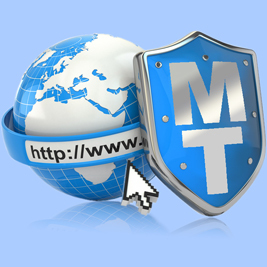 Register the Domain Name and point to your host. Within the host create your e-mail address. Set up a forward for this e-mail address so that you (the admin) receives google registration verification e-mails. Current e-mail Address (You've created this above). Upon creating the account a VERIFICATION CODE will be sent to the mobile No. This code is then to be inserted as part of the Account set-up & completion process. Advise the client of immanent Google verification codes and their need to provide them to you to complete the registration. 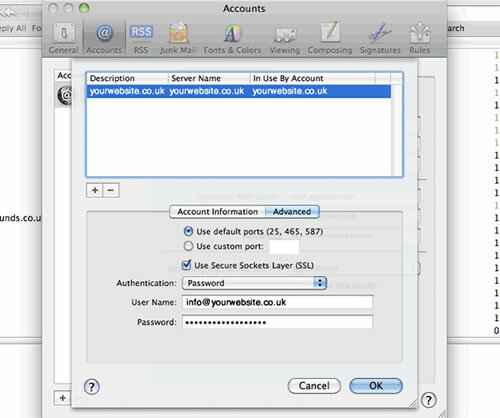 Start by providing your own admin details as the appointed Admin of the new account. The admin is who administers and pays for said account on behalf of the client. NOTE: Why this extra user? (admin). Because all Gsuite Account info reporting and including billing will be e-mailed to this (super admin) account holder. Plus it’s safer to have just one “Super Admin” as the oversee’er of the account administration. With many “Super Admins” the chances of a misconfiguration or hacking are much higher. If you currently administer the customers e-mail address through cPanel you can set up a forwarder to your e-mail address to begin the registration of a Gsuite account in their name. In this way you’ll see any Gsuite notifications and verification codes. Gsuite Account with your own e-mail address. You'll need to own the domain and/or have access to the domain's control panel. Favourite method inserting the google authorisation code in the index head section of the website. Choose the account to which you want to apply the new Google Mx Records.